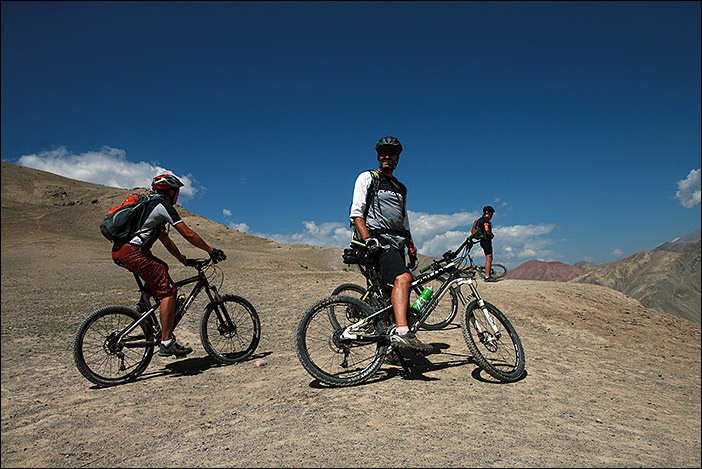 Ladakh is a paradise for active people. After having relaxed in a comfortable accommodation the first days to get relief from the exhausting arrival, never expected possibilities of activities are waiting for you. 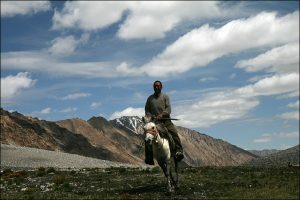 Best way to explore Ladakh by foot doing a trek - a way of travelling Ladakhis do since centuries. Little horses carry the luggage and the travellers have enough time to get into the slow speed that gives space for discoveries next to the path. But also followers of more modern or extreme sports in nature can find a rich area of variety. Several 6.000-and-more high summits offer great 360º-views, River-Rafting on the Indus shows Ladakh from the "wet side", by bicycle you can climb high passes or do sightseeings, a motorbike is great for the overland-trip or feel the wind on the highways in Ladakh, with the Jeep you can go to areas only allowed with permits and for the "hard ones" an adventurous walk on the frozen Zanskar river is a great challenge. 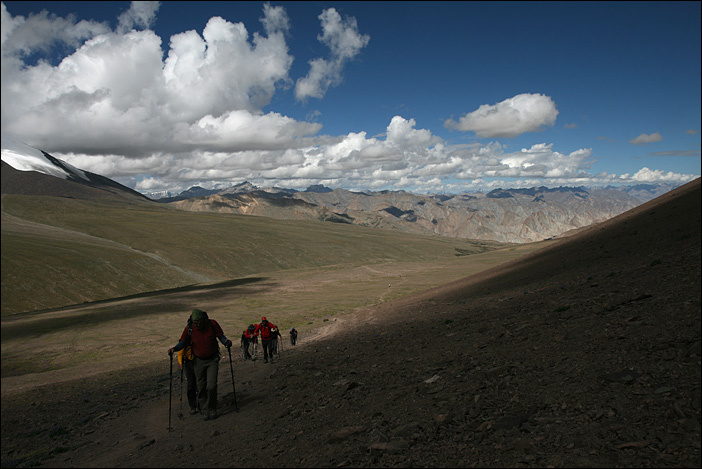 Trekking in Ladakh is a great way to experience the landscape in its full richness, admire the variety of colours and shapes of dry stones and start to slow down your rhythm of life. In this altitude is essential to decelerate and the one who is ready to do so, will manage nearly every pass even without too heavy breathing. It is fascinating to experience what is possible to reach with steady slowliness and how benefiting this different speed is for oneself. 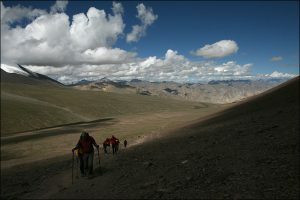 Trekking in Ladakh is totally different compared to the Alps or Nepal. The area is sparsely populated and there are neither lodges nor huts. At popular routes tea-tents are installed in the season, which have a small variety to offer. But usually you have to get everything with you (tents, food). To carry all this, usually there aren't porters (but some exceptions) but luggage horses or -donkeys. And so one starts always like a caravan. Our offer usually consists of: luggage horses, accompagnying team, vegetarian fullboard with breakfast, packed lunch, tee and 3-course-dinner, tents, thick mat (called Dunlops), camping- and nationalpark-fees as well as transfer to and from Leh. 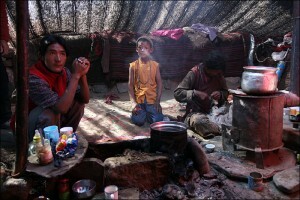 Since 2003 it is possible to do some treks without this caravan on the basis of Himalayan Homestays. Special infos are going to follow. The trekking-routes are endless. There are treks with fixed starting and arrival points, but many of them you can start nearly everywhere and finish everywhere, walk varieties etc. For sure we offer everything! We have a broad knowledge about all the different sectors. The description of the most popular treks are very easy to find in the internet. We have described the different trekking-areas, the trekking-possibilities there as well as some particular treks. It goes the most easy way if you tell us about your wishes regarding the trek (duration, grade, passes, villages, area, remoteness, frequency, anything else) and we will suggest you something suitable. Also you can choose wether you want to do a longer trek or a combination of two shorter treks, for example first a homestay-trek and afterwards a higher tent-trek. Next to the listed treks a look on the map shows that there are numerous trekking-trails and possibilities on top of it. These tours are walked rarely to never and there aren't any trekking-guides who have walked there several times. 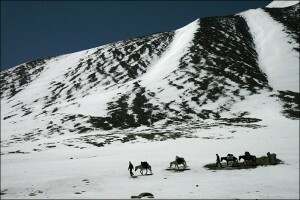 But to give you the chance to trek an unknown tour, we offer the possibilities of a so called Explorer-Trek. 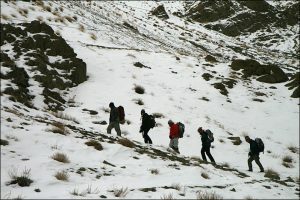 Who doesn't like to go on a several days lasting trekking-tour or wants to do some extra walks before starting for the big trek, for these we suggest some out of many day-walks in several areas, altitudes, difficulties and durations. Please contact us for more info. 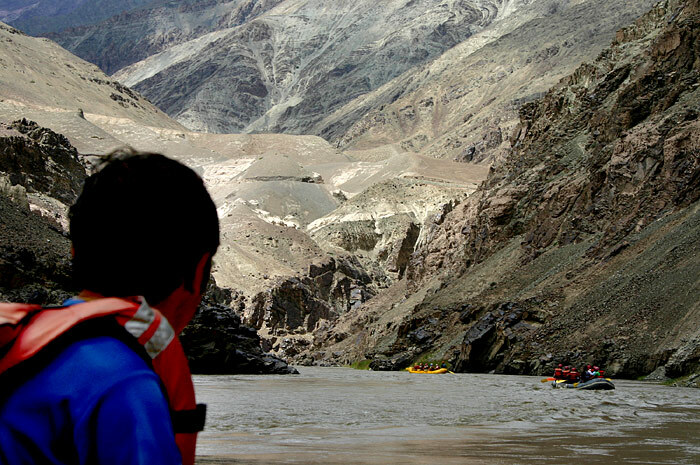 White Water Rafting is a possibility to see Ladakh from a different perspective. Especially in the hot months of July and August moving on the water can be a refreshing experience. 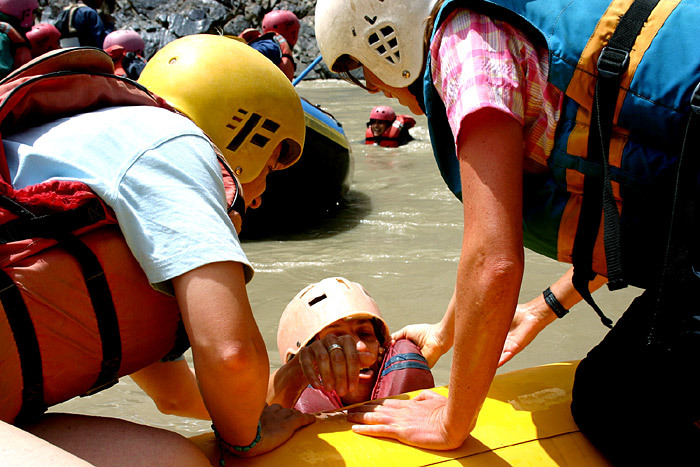 White Water Rafting is possible on the Zanskar-River and the Indus. An experienced captain guides the boat through the waves with difficulties between grades I to IV+. The times and grades are depending on the water-level. The more water there is (i.e. 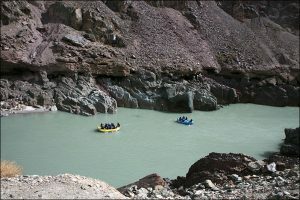 the earlier in the year), the faster the boat is and the more difficult the rafting. The time is the time spent on the river. The offer includes transfer, when required accommodation in tents, food, life jacket, if required neopren suit, the captain and the boat. A boat usually takes 8 people. 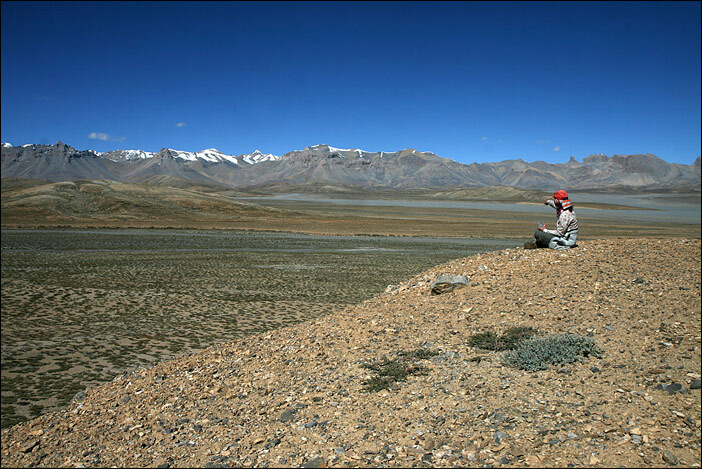 The distance Padum - Nimmu includes a 2-day-taxi-drive to Zanskar and from there on one spends approx. 4 days on the river. All infos are without warranty and dependend on the water level! By car (although still we like to call it Jeep-Safari) one can drive to the 1994 newly opened areas Da Hanu, Nubra-Valley and Changthang. At a vsit at the lakes in Changthang one usually has to overnight in fixed deluxe tent-camps on approx. 4.500 m (a good acclimatisation is required!). 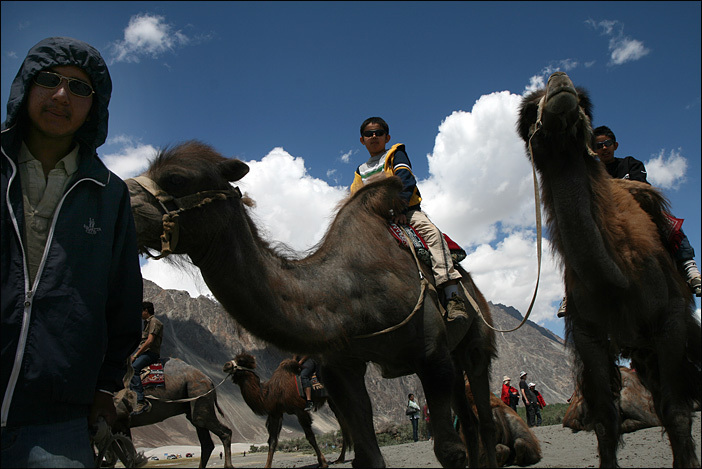 In the Nubra-Valley one can choose between Deluxe-tent-camps, guesthouses and a few hotels. In the Dah Hanu villages there are just basic guesthouses. Where you want to stopp for how long you can decide yourself in respect to your time-table. For these areas one needs a special permit which has to be done before. 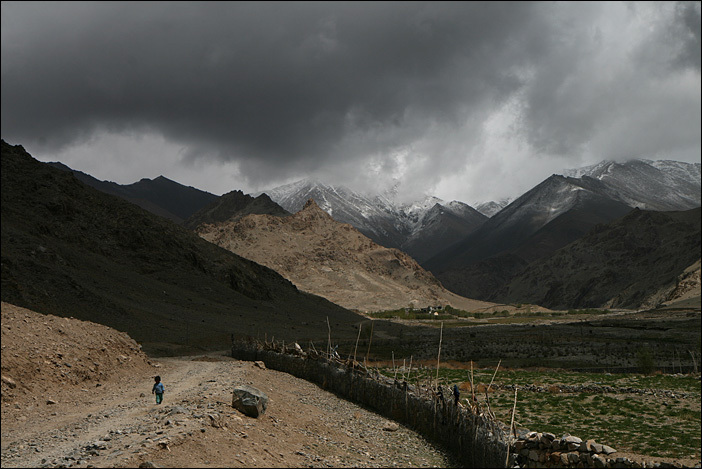 The road goes southeast from Leh towards the Rupshu-Valley, in which only a small number of Changpas, nomadic shepherds, who also do trading with Lahaul and Spiti, are living. 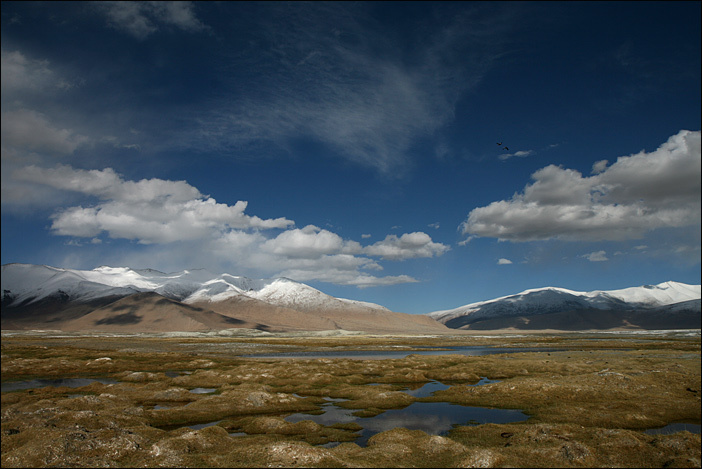 Villages are rarely to find, but the area is very good for spotting wildlife: Kyang, Red Fox and the very rare snowleopard. In the summer months blackneckcranes and geese are flying towards the shore for breeding. Tsokar lake is a salt-lake with ducks living on its shores. The Tsomoriri-lake is surrounded by 6.000 m high snowcapped mountains. At the west-banks is the village Korzok with approx. 100 families and a 350 years old monastery (30 monks of the Gelugpa-sect). Day 1 Leh - Chumathang (Hot Springs) - Korzok (Tsomoriri), Driving time approx. 7 hrs. Day 3 Drive via Puga Valley (Gouvernment-School for the nomad children) to the Tsokar-lake, driving time approx.. 6 hrs. Day 5 Drive via Taglang-la (with more than 5.300 m the second highest motorable pass of Ladakh) back to Leh, driving time approx. 5 hrs. For sure you can also visit the lakes in 3 days, but then there is not so much time for walks, observations in the nature, contacts etc. 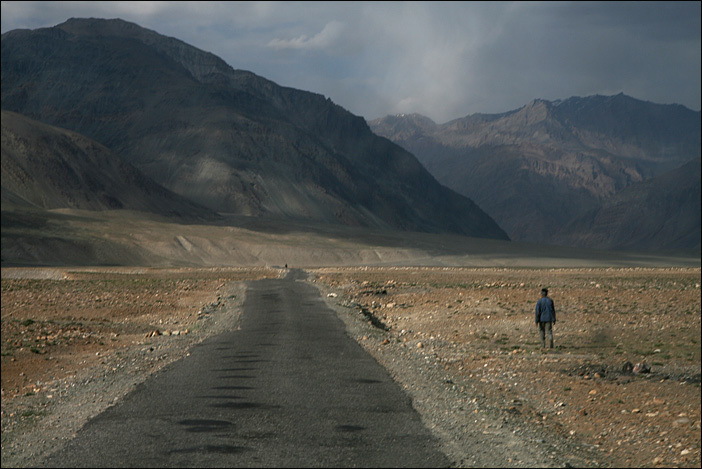 The road leads via the 5.300 m high pass Chang-la, east of Leh. 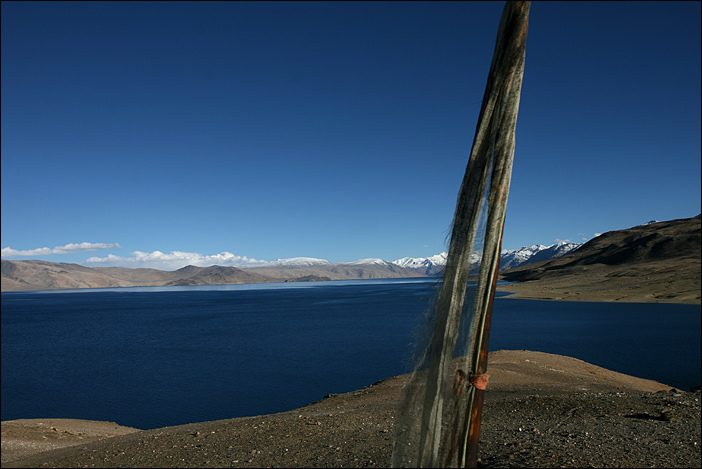 Driving through the villages Tangtse and Muglib one reaches Pangong-lake. Since 2010 it is possible to drive approx. 30 km along the south shore and overnight in three villages: Spangmik, Man and Merak. Pangong-lake lis located at an altitude of 4.260 m, 136 km long and belongs ¾ to Tibet. The little salty lake is home to a variety of bird-species. 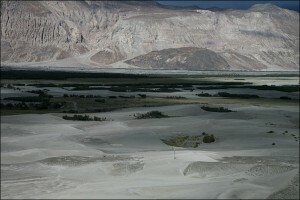 Driving from/to Leh takes each approx. 5-6 hours. One should take at least 3 days for such a trip. 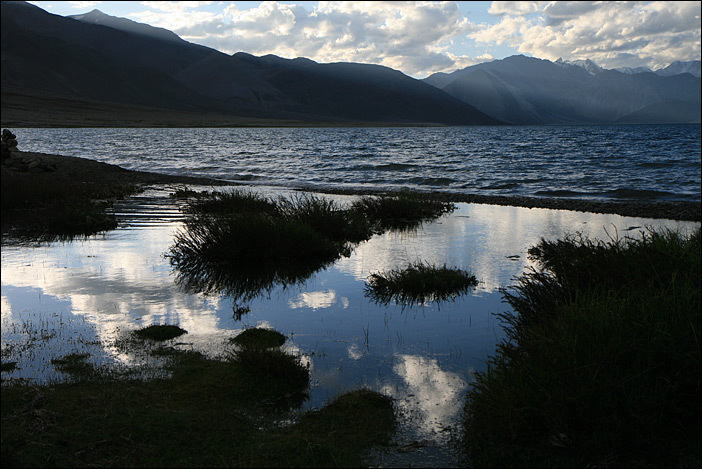 The lake changes due to weather condition its colour, one can take nice walks on the shores and between Man and Merak one can climb the 4.760 m high Pangong Kangri Chogota. 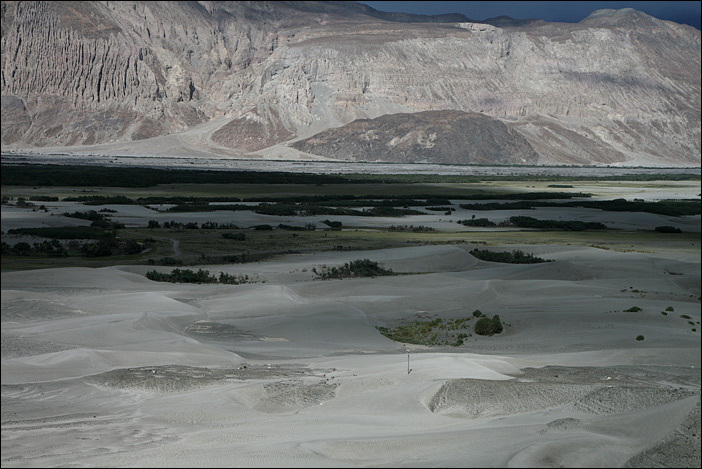 North of Leh, reachable via the pass Khardong-la (5.359 m), is the region Nubra. Until recent times caravans were doing their trading along that route. 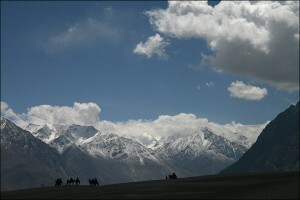 With a little more vegetation as in other parts of Ladakh, Nubra counts as the so called "flowergarden". This label became unfortunatly quite a source of disappointment for some travellers: for sure Nubra Valley is a high altitude desert with lots of stones and pebbles. Here you can find some interesting monasteries in Hundar, Deskit and Sumur, the hermitage Ensa thrones high above Panamik, the holy lake Yarab Tso, the hot springs of Panamik, sanddunes at the confluence of Nubra and Shyok and some of the leftover camels, which were used for the caravans and nowadays for riding in the dunes. 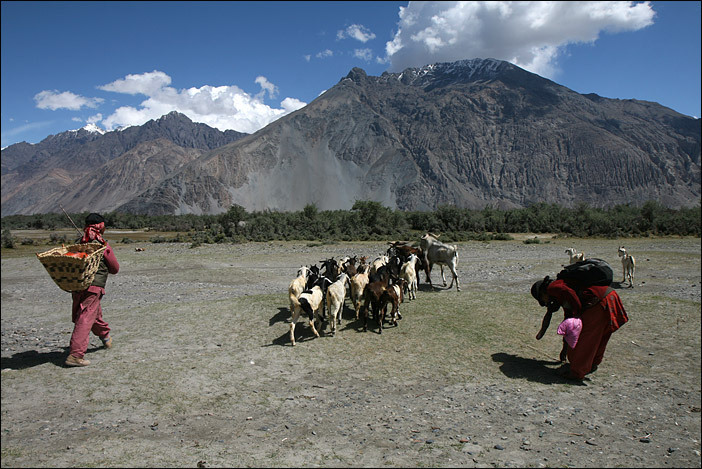 Nubra Valley can be visited in a quick tour in 3 days or more relaxed in several days. Since 2010 one can go towards the west from Hundar to the only baltic village of Turtuk. In the rarely visted east are some villages with small monasteries and homestay-accommodation. In an idyllic surrounding there are several indo-arian villages with the main places of Beema and Dah, which can be visited. In this part of Ladakh there are Ladakhis of arian origin, that means one can find some times blue and green eyes and fair hair. Also the traditional costumes differ from the ones in other parts of Ladakh. On their heads they like to wear flowers. This is possible as here are much more flowers growing. Main village is Dah, a pittoresque village with houses on steep slopes. On this altitude of just 2.900 m there are many walnut- and apricot trees and even grapes. In July there should be a harvest festival. 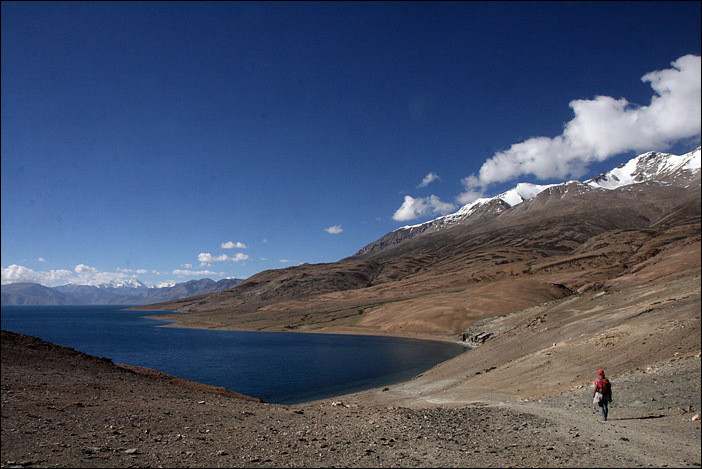 One can drive either from Leh to Dah and back or continue via Batalik to Kargil. 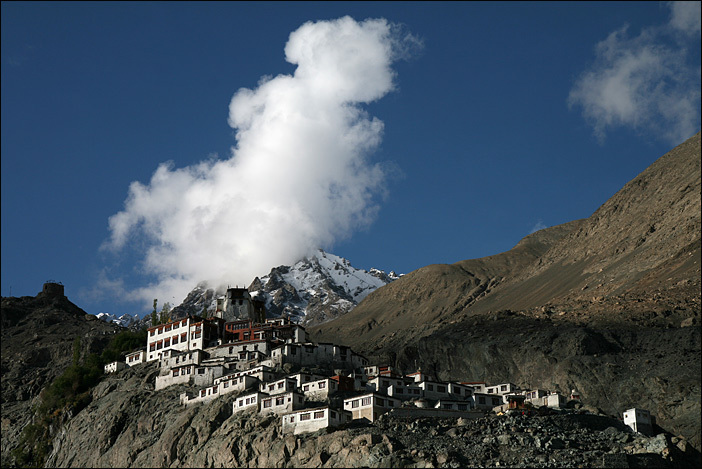 As the villages are just 150 km away from Leh and there are no major ascents, it is advisable to visit more monasteries and villages on the way along the Indus are combine the tour with a sidetrip to Lamayuru. It is woth to stopp in Dhomkar for the petroglyphs in the rock garden. There is also a small road between Sanjak and Khangral. 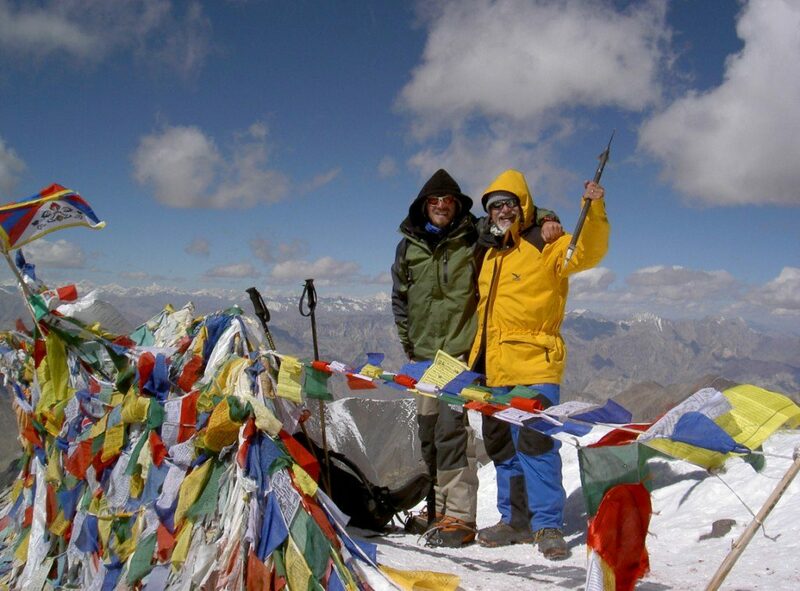 Expeditionen on very high mountains cannot be offered in this area, but some summits above 6.000 m and in Ladakh and the 7.000er twin-peaks Nun and Kun in Zanskar are recommendable options. One has to pay summit-fees - peaks below 6.200 m are trekking-mountains and not so expensive (approx. 40 Euro p.P. ), peaks above are quite more expensive (depending on groupsize). We list the walk on the frozen river Zanskar in the winter here, too, as it is quite a little dangerous challenge due to open spots in the ice. 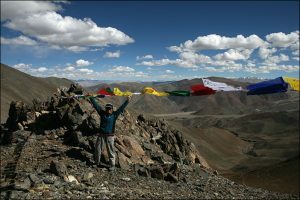 Stok Kangri is a 6.120 m high mountain (category: Trekkingmountain) directly opposite Leh on the other side of the Indus. A tour takes 4-5 days. Starting point is Stok. From there one has to gain 2.500 meters of altitude towards the summit. In every season there is snow on the top, so iceaxe, crampons and ropes (included in a booking with us) are necessary. Luggage horses make the ascent easier. One can include the Stok Kangri also in the Markha-Valley-Trek. Kang Yaze is a 6.400 m high mountain, which can be climbed from the high valley in Nimaling. Starting point is Shang Sumdo. From here one treks via the pass of Kongmaru-la (5.150 m) to Nimaling. 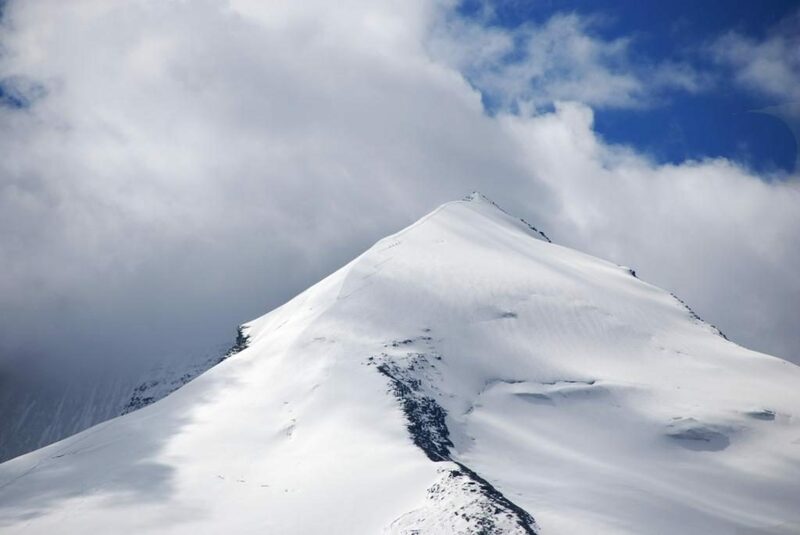 2-3 days are counted for the ascent to the Base Camp, another for the Advanced Base Camp and after that one needs again a day for the summit and the way back to the Base Camp. 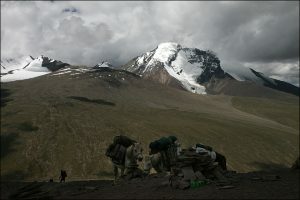 Next to the Kang Yaze is the little lower Dzo Jongo with 6.280 m. The climb starts at the same Advanced Base Camp. One can just aim at this peak only or do it together with Kang Yaze. 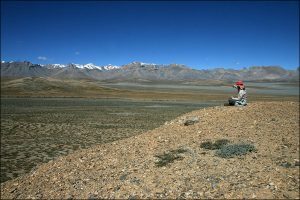 Both can be included in a Markha-Valley-Trekkingtour. Around Tsomoriri-Lake are some nice mountain-peaks above 6.000 m, which can be climbed nicely: Chalung (6.500 m), Chamser Kangri (6.600 m), Lungser Kangri (6.650 m) in the East and Yalung Nong (6.080 m) as well as the Mentok-peaks I (6.250 m) and II (6.210 m) in the West. Incl. 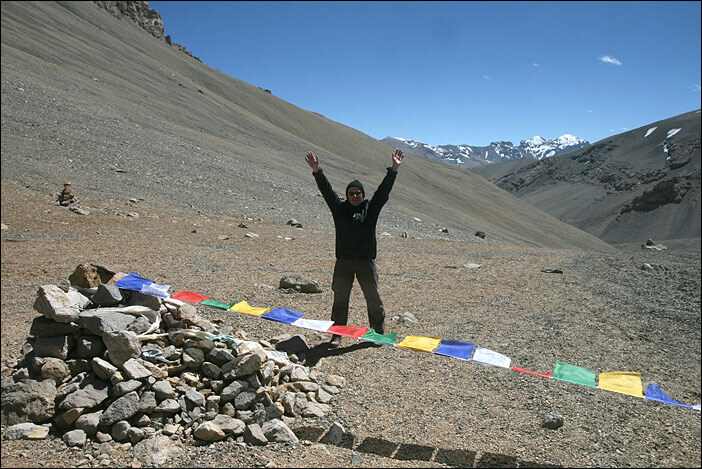 Travelling from and to Leh a climb is possible in 6 days. For sure one can combine some peaks. As one has the first overnight already on 4.500 m, a good acclimatisation is essential! 2014 Chamser and Lungser Kangri were closed - we are waiting for a reopening. 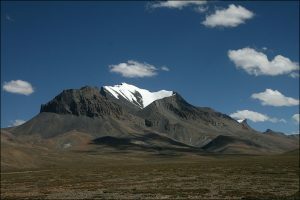 The 7.000er Twin-Peaks Nun (7.135 m) and Kun (7.090 m) are in Zanskar. Kun was first climbed in 1913 by the italian mountaineer Piacenza, Nun only in 1953 by the swiss Madame Claude Kogan. 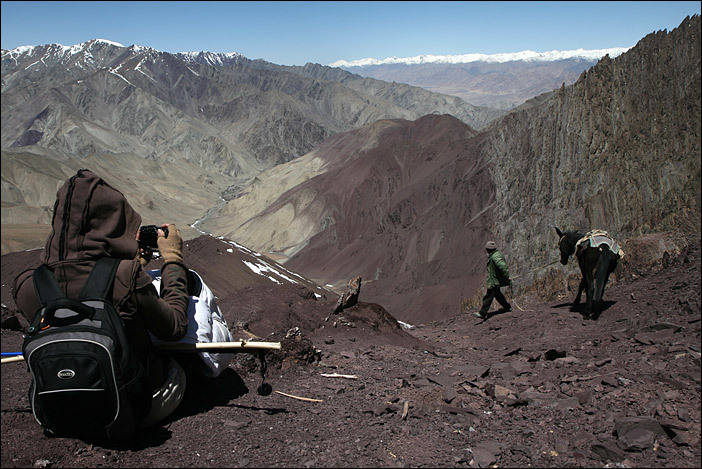 The journey starts from Kargil to Parkachik, where one has to do the climbing which will take approx. 10 days. 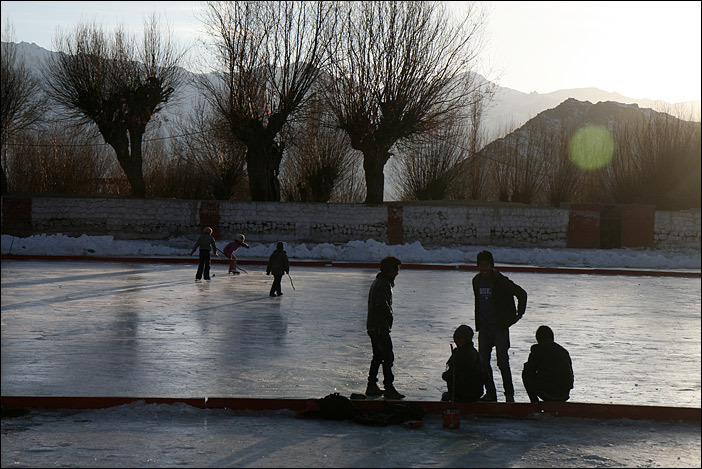 When the Zanskar-River is frozen in the winter, it offers the Zanskaris a quite fast possibilitiy to get into the Indus Valley and to Leh. Who wants to join this adventure in January or February, has to adjust to approx. 8 days of walking on ice with leaky spots and icecold nights in a tent. 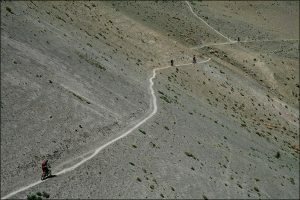 Back one has to take the same route or get a helicopter from Padum or wait until spring in Zanskar for the opening of the road. For sure one can also just walk to Lingshed and back. 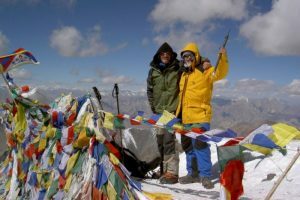 There are more less known and maybe unclimbed peaks - let's talk if you are interested in discover new experiences! 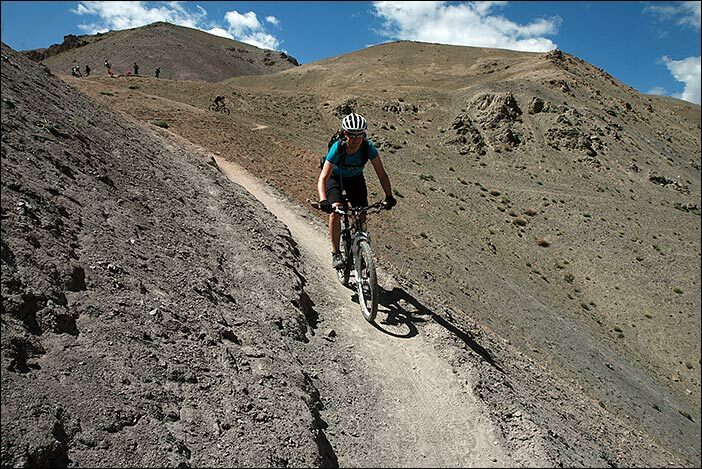 Ladakh doesn't have a tradition in cycling. On my first visit in 1993 I didn't see any bicycle at all. In the following years there were more and more tourists with bicycles observed by the locals with huge eyes. Nowadays also some Ladakhis are owners of bicycles. 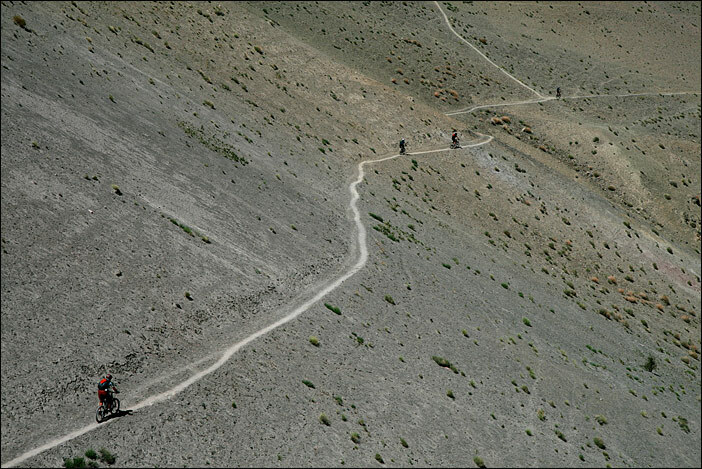 But unfortunatly the cycling in the Indusvalley and around is still a little uncomfortable. The roads are sometimes steep and often in a critical condition (and if not, the cars are speeding). The motorised traffic-vehicles are often reckless and one is challenged by exhaust gases. Who is not scared by that, awaits the highest driveable roads in the world in a breathtaking landscape. One can go from Manali to Leh, from Leh via the Khardong-la into the Nubra-Valley und from Leh via Kargil to Padum or Srinagar. 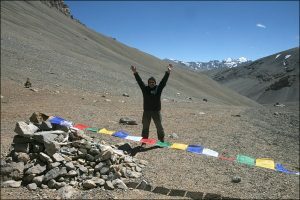 Another idea is the Changthang-roundtrip for which one has to be acclimatised well as one is mostly on 4.500 m altitude. A big part is a bumpy rough road. It is worth to take the package with accompagnying car, tents, thick mats and a cook. 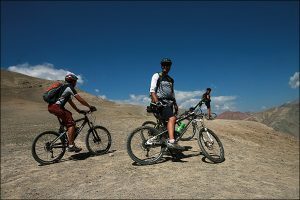 Who thinks that these tours of several days are too much, but would like to kick the pedal, can do a daytour with the bicycle starting from Leh on roads with less traffic. The bicycles to rent are good mountainbikes, which are easy to handly on the sometimes rough roads. 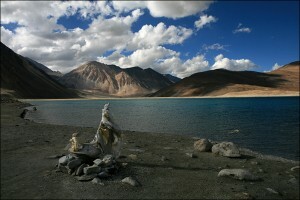 Ladakh is very appealing for motorbikers. There is comparativly less traffic and the surrounding mountains are terrific. The condition of the roads is different: while the road in the Indus Valley is well tared, other sectors are more tough. Who starts for Padum should know that this is going to be a realy dusty and stony issue. 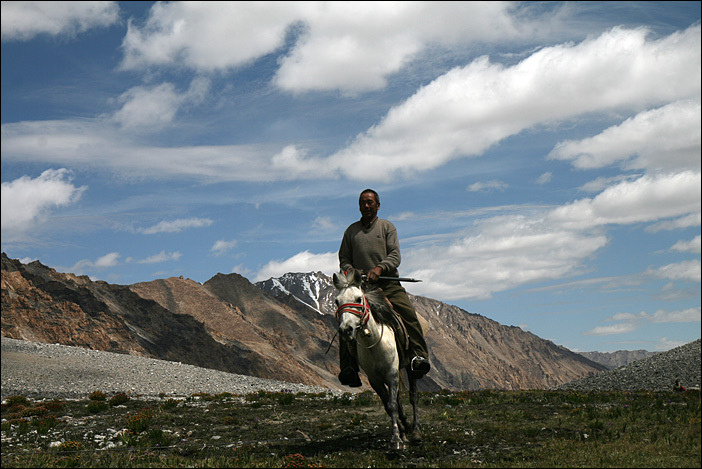 The Nubra-Valley is quite well to do, just around the pass you can face some difficulties, Between Tsomoriri and Tsokar in Changthang there is less tar. A special excitement is for sure a journey from Delhi or Chandigarh maybe even via Spiti to Ladakh. One can rent a motorbike there (Enfield, Honda and Yamaha are the most common brands), which are transported back, while one is taking a flight. Yangla Tours likes to organise an All-inclusive-package with accommodations and if desired an accompagnying car. Due to some strange rules and regulations, it is not allowed to enter Ladakh with a motorbike from Himachal Pradesh (Spiti, Manali) and vice versa. 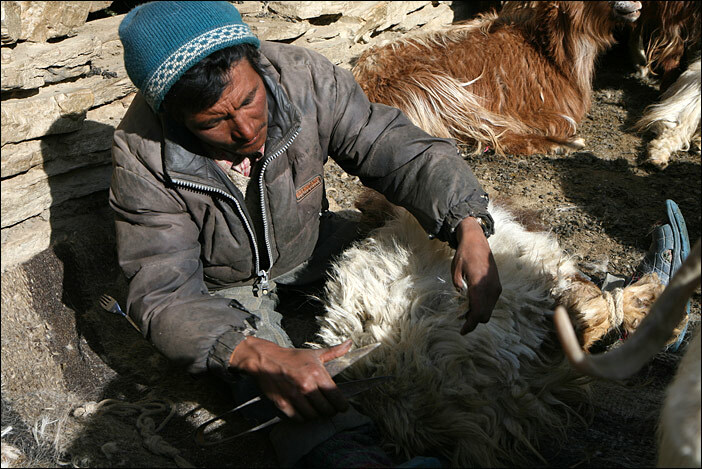 But no problem: in Sarchu you will change the motorbike easily. For shorter trips one can also rent a bike with us. One just needs a drivers license, The fee is without petrol (attention: in some areas there are just few petrol pumps, please inform yourself before starting!). A helmet comes included in the rent.